The biggest building in town is the Sacred Heart of Jesus Catholic Church; a notice posted next to the front door said Mass is celebrated there on the third Sunday of each month, at 2:00 p.m. That door was locked, but the side door wasn’t. I let myself in and spent a happy hour inside exploring and photographing. 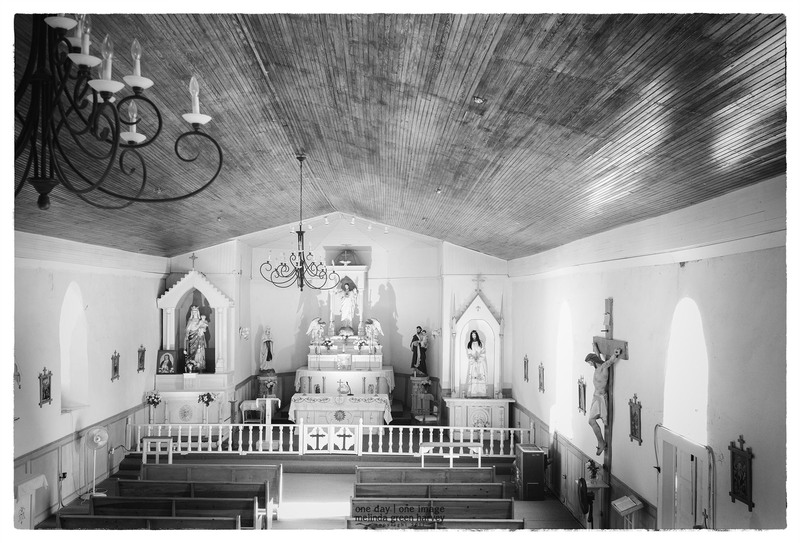 This view, from the loft, was my favorite and I was especially captivated by the shadows behind the altar. Posted on November 21, 2017, in Photography and tagged 365 photo project, architecture, black and white photography, church, journey, learning to see, Leica, melinda green harvey, monochrome, Mystery, one day one image, photo a day, photography, postaday, road trip, Sacred Heart of Jesus Catholic Church, shafter, shafter texas, texas, thoughtful seeing, travel, travel photography. Bookmark the permalink. 2 Comments. I was very lucky – it was the best part of the trip.